Simplifying Collaboration & Enhancing Decision Making Across the Organization. Redwood City, CA, February 25, 2016 — Workboard, the leading real-time goals and alignment app, today launched availability of an exciting and powerful new visualization of agile goals and business decisions across the organization. 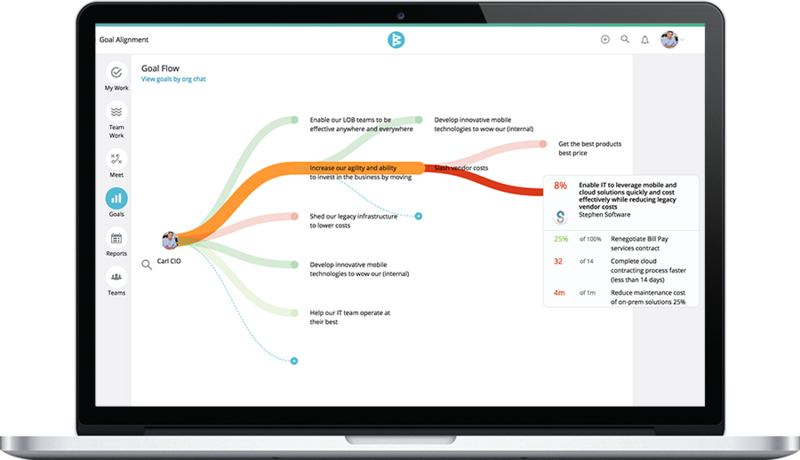 These new interactive visualizations make it the most advanced and intuitive goal management solution available today; Workboard is widely adopted by CEOs and CIOs as a vehicle for new agile goal management such as Objectives and Key Results (OKRs). As more companies move to agile goals and real-time business management, the need to see connectivity between teams, goals, purpose and progress in real time is key. Workboard Inc. provides real-time goal management solutions to help leaders and teams operate at their best and achieve big, bold goals. Its next-generation mobile and web app helps business leaders increase their velocity through dynamic short-range goals or Objectives and Key Results (OKRs), goal-aligned execution, and higher impact coaching and recognition. More than 67,000 teams use Workboard to make work easier, more meaningful, and successful. For more information, visit www.workboard.com. Workboard's new goal visualization provides insight into the connectivity between teams, goals, purpose and progress in real time.